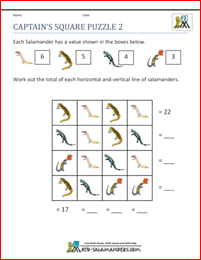 Welcome to the Math Salamanders Free 3 Digit Subtraction Worksheets for 2nd Grade. Here you will find a wide range of free printable Second Grade Math Worksheets, which will help your child achieve their benchmark for 2nd grade. 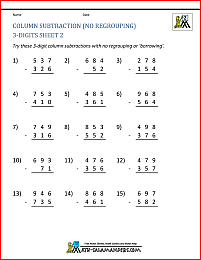 Here you will find a range of Free Printable Second Grade Math Worksheets for subtraction set out in columns. 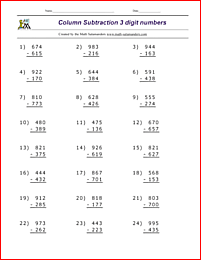 The sheets have been divided into two sections: those with no regrouping and those that involve regrouping. subtract numbers up to 1000. 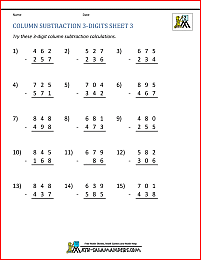 Here you will find a selection of 4 short video clips demonstrating how to do 3 digit subtraction. 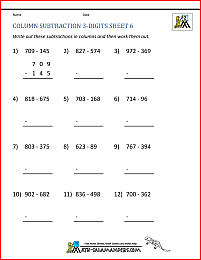 Here you will find a range of Free Printable Second Grade Subtraction Worksheets. All the free Second Grade Math Worksheets in this section are informed by the Elementary Math Benchmarks for 2nd Grade. 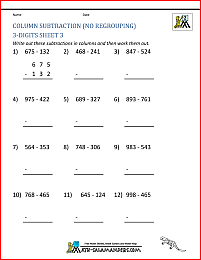 All the 2nd Second Grade Math worksheets in this section are informed by the Elementary Math Benchmarks for Second Grade. 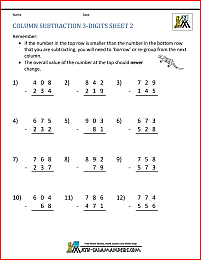 Here you will find a range of printable 2nd grade math puzzles for your child to enjoy.